The first impression of this machine is that it has been hauled out of a lake or lifted from the local seabed after half a century. In actual fact it has only been bolted in place in the Bitterne workshop (pictured) for approx fifty years. Clive, who I bought the machine from, told me that he had last seen it working in 2000 when his father was using it for making model railway parts. Since then the wiring has perished but the motor pulley still spins round which is promising. The spindle is indeed seized solid but from previous experience it will not be hard to free up. It will just need patience...and a lot of WD40. Maybe even a medium sized hammer. Pictures below: machine from the left and right. It's when you see the D715 sideways on that the difference in size to the 900 series becomes apparent. The 700 column diameter is 2" opposed to the 3"diameter of the 900 series. Above: the machine from the left. Below: Well, here it is all stripped down into components. It took a lot of hard work and more WD40 than anticipated. So where do you start on a restoration like this? Well the workshop is a good bet. First of all I stripped all the parts from the head casting such as the locking levers and blocks for the head and quill and , the capstan wheel complete with its wooden knobs (stop it! 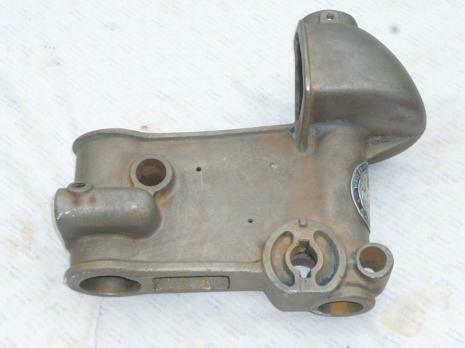 ), depth adjuster, return spring housing and spring and locking bolt for the motor plate. The motor and plate have already been removed for maintenance. Interestingly the D715 was not sold with a capstan wheel instead having to make do with a steel bar. I would think the wheel was added to improve accuracy on repetitive work. A good touch. Below: If you meet resistance tapping out the feed pinion then the spring retractor pin may still be in place and out of sight underneath. Not that this happened to me of course. Below: the iconic decal needs no introduction. I would like to tackle restoring the decal as they look great when done. And completes the project. This Driver Line decal is more intricate than the art-deco Walker Turner of the early 1940s. Restoration update: paint stripping and rust removing on the various components is in full swing with my apprentice getting stuck in. The machine head has been sent off for sandblasting to a mate of a mate if you know what I mean and the pile of cleansed steel is growing. Above: yes it's back from being shotblasted by that mate of a mate. Big thanks to Big Mick. 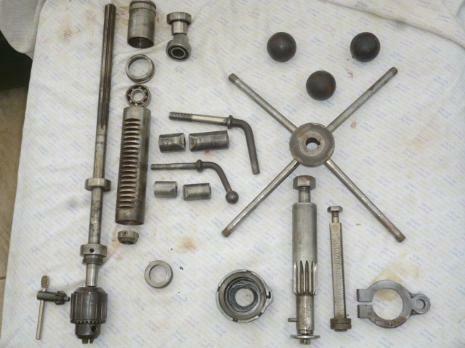 Above: all the components seen above have been cleaned and are ready for reassembly when the time comes. Above: the pulley bearings ready for repacking with grease. 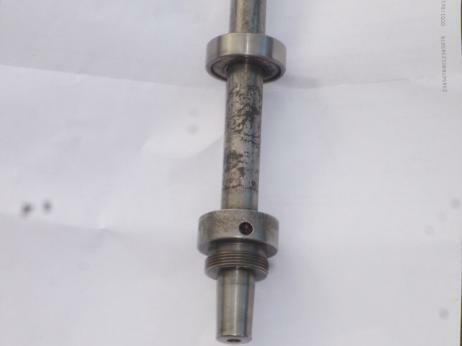 Compare the before (above) and after (to the right) photos of the spindle. What do you mean you can't tell the difference? Apart from the exposure rating on the before photo. All the priming has been done now and the dark grey spray paint and camera have arrived. So it's time to update. And what's with the spacing difference between this column and the other? Serves me right for trying to be flash. Above:The finished paint job on the machine head. We split the spraying between us. I took the motor and switchbox while my apprentice took the glory with this sterling work on the machine head, motor plate and table. A sight for sore eyes. All restoration work completed and ready for reassembly. We are really pleased how all the bits are looking and are well keen to reassemble and fire it up for the first time in nearly fifteen years. Looks like it's all there...it's annoying how surface rust has appeared already. Will sort that out. Above: We decided to start the reassembly by putting the motor back in to its cradle which is instead of a foot plate fixed to the motor. A rubber mount is slipped over the spindle on either side and fitted to the body. Clamps then secure the mounting around the rubber tightly. It is then bolted to the motor plate. Known as a resilient mounting according to Jim Cox Electric Motors Second Ed. That's news to me Jim so thanks. Below: Here is a badly resized pic of the machine head and table back on the pillar and looking like business. Squashed anyway. Photo to be replaced as soon as possible. There's still plenty to do but not much will be happening on this particular resto for the Easter holidays are upon us. Look out for the next update in mid to late April! I'm hoping to add a video of the first start up for fifteen years. May 2014. The project has been completed. The drill has been reassembled and run for the first time. June 2017 Update: this has now been sold to WT enthusiast Julian Harrison. Above: and from the right. Below: I take back what I said about this machine having possibly been stored on the local sea bed. It definitely has. However the part that was worrying me the most was the collet that sits above the chuck at the bottom of the spindle and is screwed on to the thread seen above. This collet forces off the chuck when it is wound down as the chuck is held on by friction only. But I needn't have worried as the machine had clearly been owned by an engineer who appreciated good machinery. The collet moved easily at first time of asking and the chuck dropped off effortlessly. 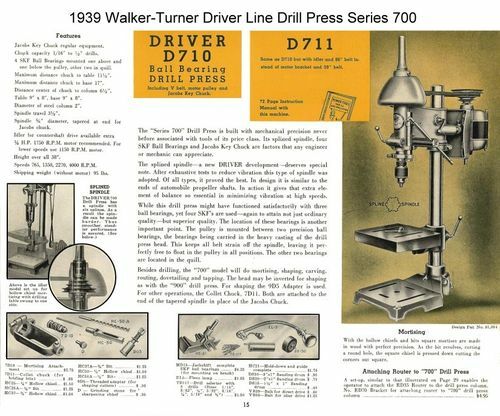 What a contrast to that of the WT 900 floor drill that had worked in a West Dorset quarry since the end of WWII. That collet had to be worked with a stilsons to get movement thanks to the apprentices and cack handed quarrymen abusing it in the past. It also had the worst arc of shame ever seen! However it may have been acquired earlier in a 1939 air raid from Luftwaffe leaving nearby Swanage in a hurry. 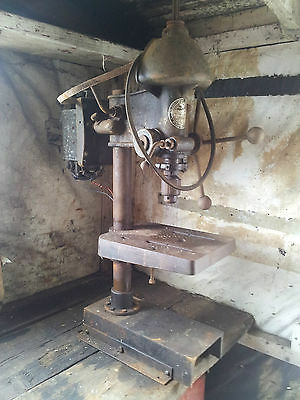 Left: Looking at the bits on the bench I'm wondering if this is ever going to be a functioning drill press again. The wooden balls are resting in a tray of boiled linseed oil as they are very dry and cracking. In the other tray are three of the four bearings, two of which are still moving, the other seems rusted solid like the one left on the spindle. 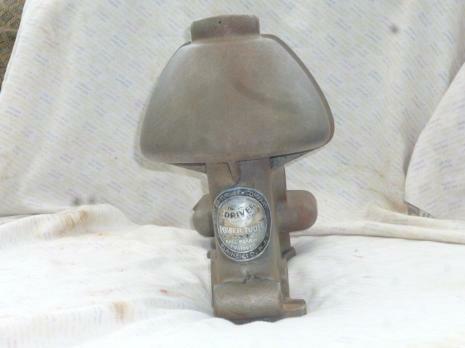 On with the stripping and the first step is to remove the pulley wheel from the head casting. The upper bearing sits in a moveable bush which needed some persuasion to move as usual. Then I prised the top bearing off of the top of the pulley allowing me to lift it off the lower bearing and remove it. The lower bearing came out easily as did its retainer set in the head. Now for the spindle which has been soaking in WD40 for two weeks. Looking down the quill chamber the amount of rust was not inspiring but I tentatively started tapping the spindle downwards and was relieved to find movement. It's not ideal but the parts are so substantial that it is unlikely to do serious damage if careful. (For a working drill the process is different.) 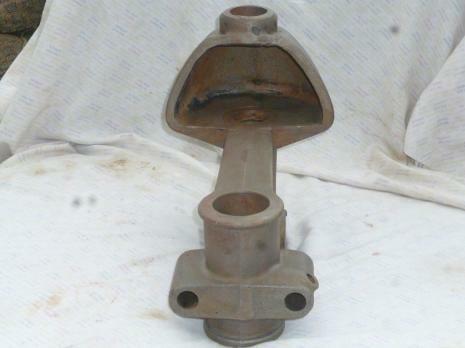 As the spindle begins to drop out the rust and corrosion is concerning. It becomes apparent that all the moisture collected whilst in storage since 2000 has funnelled down and locked the quill in the position it was left in. For as the spindle finally drops out something is clearly missing ie the quill. This requires tapping out carefully from above with a piece of timber to avoid damage. Left behind at the top is the bush from the top of the quill. So it's all apart now excepting the stripping of the spindle and it seems that apart from some serious corrosion, everything is in restorable condition. So the project is a goer and progress will be updated here. Below: what I call the money shot, both bearings in situ. The pulley bearings are hard to find replacements for. I am stalling on choosing the finishing colour. The WTs were sent out in a greeney grey colour, the paint code of which is available but is it worth it for a small project like this? I do actually have three other machines from the WT catalogue but I think economics will dictate a simple industrial grey. Above: repainting that decal is going to be an interesting test of my nonexistent painting skills. Could have got messy so didn't do it. Above: the motor fitted proved to be unsuitable after all that time but I have a suitable replacement. 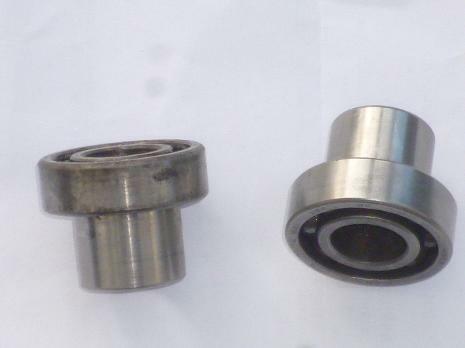 Above: the full set of four bearings supplied in the original design. When I dropped the spindle and quill out of the machine head in the first instant, I did wonder whether it was ever going to be a viable pillar drill again. 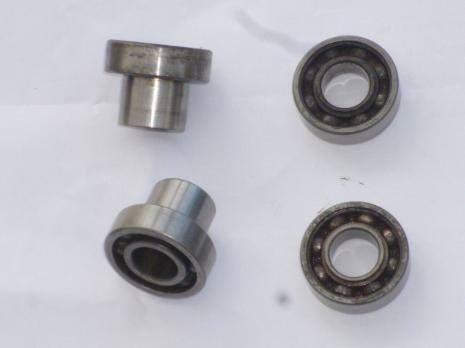 The bearings seemed to be seized beyond repair but after a good soaking in oil they were gradually worked free. I flushed them out with Wd40 making sure there was no debris left behind and then my apprentice repacked them with a bearing grease. He's more used to packing out car wheel bearings and found them a little more fiddly but managed a good job. Above: everything has had two or three coats of paint and is ready for reassembly. Top right is the cradle for the motor to sit in. The new switch has been wired in and connected to the motor. A classic English electric motor that is possibly overpowered for this drill press but to be honest I don't speak the lingo. Just wondering if that motor is going to look too bulky when mounted. Above: Here we have some "ironmongery" going back into the machine head. The lower bearing retainer is positioned as are the column locking lever and blocks. At the front, the quill locking lever and blocks have gone in. With that done it's time to refit the head back on to the pillar from where it will be easier and necessary to finish the reassembly. Below: The lower bearings are fitted and the spindle is being fed up through. Although I have stripped and rebuilt a WT900 several times this is no less enjoyable. It is a great feeling to be putting these clean pieces of engineered metal back together. You know what I'm talking about!